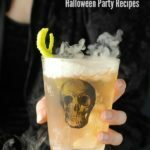 Dry Ice is the hit of a Halloween celebration from drinks to decor. This guide gives all the details of where to buy it, how to use it, how to handle it and store it. It’s that time of year. 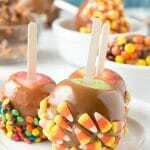 Halloween parties are in the planning and class parties too. There is no more ghostly affect than dry ice but are you ‘in the know’ about where to buy it, how to use it and how to handle it? This easy primer will give all the dry ice facts needed to ensure a safe, ghoulishly great experience. Dry ice does take special handling! 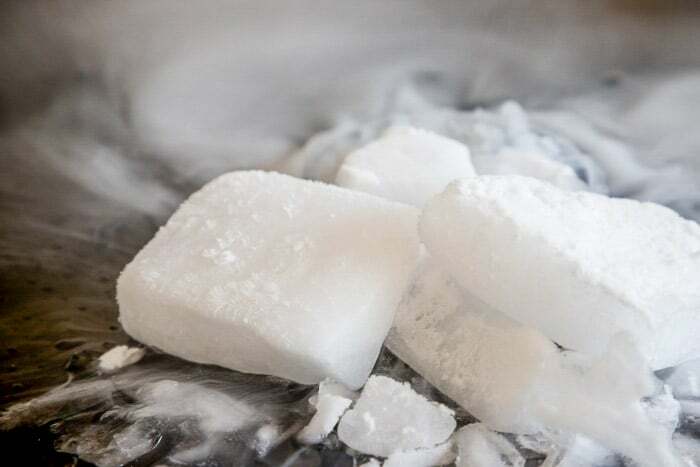 Dry Ice is solid carbon dioxide frozen to -109 degrees (which will cause frostbite hence special handling needed). When added with liquids it creates a ghostly fog effect and bubbling like a Witches’ Brew! Dry Ice is available at most grocery stores: Safeway, Kroger/King Soopers, Walmart, Costco. Call ahead to ensure your store carries it (and if they don’t ask if they know who does; you won’t be the first person asking). Go to the Customer Service department where they will ring up your purchase and retrieve the dry ice from a special freezer not available to the public. Dry ice comes in blocks usually of between 1 to 5 pounds. You’ll be asked how much you want when purchasing. When using it for punch I generally buy a 1-pound block which costs between $1-$3. It’s often well more than is needed. It immediately begins to evaporate so plan to use in within a few hours. By the next day it will have completely evaporated. Halloween is a very popular time to buy dry ice. Should you be looking for some in October definitely call ahead to ensure your store has it in stock. 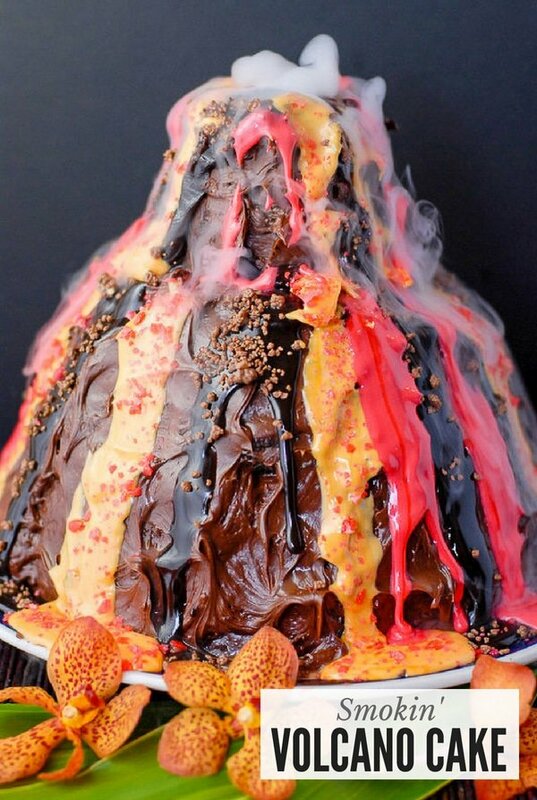 This Smokin’ Volcano cake is contrusted with a paper cup of water inside so dry ice can be added to create the smoke effect. Take a hard-sided cooler and towel to wrap it in. Do not store it in glass or metal containers. If you will handle it there, you’ll also need work gloves. NOTE: do not plan to keep the cooler in a car for a lengthy trip. The evaporation begins immediately and the cooler will not contain all the carbon dioxide. If traveling more than 15 minutes, keep windows open for good ventilation. Adding dry ice to liquids, water or drinks, causes the chemical reaction making the smoke. It must be added to liquid for the smoke to occur. Dry Ice begins to smoke immediately when put in liquid. It’s great in a Halloween punch for that reason though the smoking only last 10-15 minutes’ish. Left unused it will evaporate within 24 hours. How to Break Up a Block of Dry Ice for Use? Break up the block by hammering it through the towel it’s wrapped in while wearing work gloves. CAUTION: IT WILL BURN YOU so you can NEVER HANDLE IT WITH BARE HANDS. Please also if working around children be very careful of this as well. 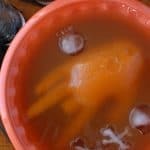 Are Food and Drinks Exposed to Dry Ice Safe to Consume? I have several friends who are doctors and have consulted about any ill effect of food or drink that has been around dry ice. There is no issue with any sort of contamination though if drinking punch that has had dry ice in it be sure no little piece remain in the cup which could cause a burn. Store the dry ice in the cooler and towel used to buy it in a well-ventilated area. Coolers are not airtight so as the dry ice evaporates some of the gas will escape. Do not store the dry ice in your refrigerator or freezer. Do not store it in a tightly enclosed area. Do not leave dry ice out where people or pets can come into contact with it. Simply allow the dry ice to evaporate in the cooler if you don’t use it all. Do not flush it down a toilet or drain (it can freeze pipes). Do not leave it open to evaporate where the gas could be inhaled in large quantities. Thanks for helping me learn more about dry ice. It’s kind of cool to learn that the smoke from the dry ice might only last ten to fifteen minutes. It seems important to consider this time frame, especially if it determines just how much dry ice you may need for a certain event. Such an informative and helpful article, thanks for sharing! Dry ice has always scared me a little bit so I’ve never bought it or tried to use it ever. This is some great info! So much good info! You answered so many of my questions! I always wonder e how to use this and if I was safe to ingest! Thanks for clarifying! This is SO awesome!! Perfect for our Halloween party!! I can’t wait to make it! I learned here a lot of new things about how to use dry ice. I want to use it for my Halloween party and I think I need to look for a place where I’ll buy it in the same day! Thanks for all this useful information! Great info. It seems like there is a lot to know about dry ice. Every year I see where someone has done something dumb. Everyone needs to read up before using it. That’s for sure. Amazing tips on how to use and purchase dry ice. I was wondering was it truly safe to consume and also I had no clue you can buy them at you local grocery chain store. Looks awesome! These are absolutely great ideas and helpful, this is a keeper! This stuff is so neat, but you have to be so careful with it too. It’s fun to see all the neat things you can do with dry ice. It makes for some fun Halloween stuff too. It’s true you can’t consume it but once it has evaporated whatever it was in is safe to consume. Does that make sense? I do not think I have ever read a post about dry ice. You covered all of the different questions that I wondered about. I did know it can burn you and to not touch it with your bare hands. I love the look it gives to the drinks and that cake? Out of this world! I’m glad it was helpful! I think dry ice is one of those cool things people don’t realize you can just buy; but it does require some care too! Such a great resource. What a great way to bring entertaining up to the next level. WOW! Ok that was really fun to read and informative. I had NO CLUE about dry ice, but always wondered things like when to buy it and how to dispose of it. Now I know! Thanks! I’m glad it was helpful Jeni. I think dry ice is one of those things that you don’t think about until you need it…..and then have no idea where you’d find it (it seems so exotic)! That’s good to know. I always wondered how to handle dry ice around kids. This looks like it’s probably better for an adult party. Its definitely not something to have in a little child’s reach. We would use it a classroom Halloween parties in a cauldron for punch but made sure to keep it out of reach until the dry ice had evaporated. I feel so silly, I did not know dry ice was so easy to attain! I have received it with deliveries, I wonder what they do to make it last longer when the meat companies use it for mailing food. Thanks for these ideas right before Halloween! Mitch I did not know either until my kids were in elementary school and a mom I was planning a Halloween party with for the class filled me in. I think it’s that ‘wisdom’ passed from parent to parent; now you know too! This is such a helpful guide. We’re lucky that two stores near us get shipments of dry ice frequently so we can pick some up if we need it! 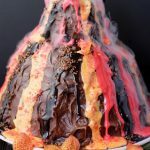 I always love the recipes I see this time of year that have a dry ice element to them. 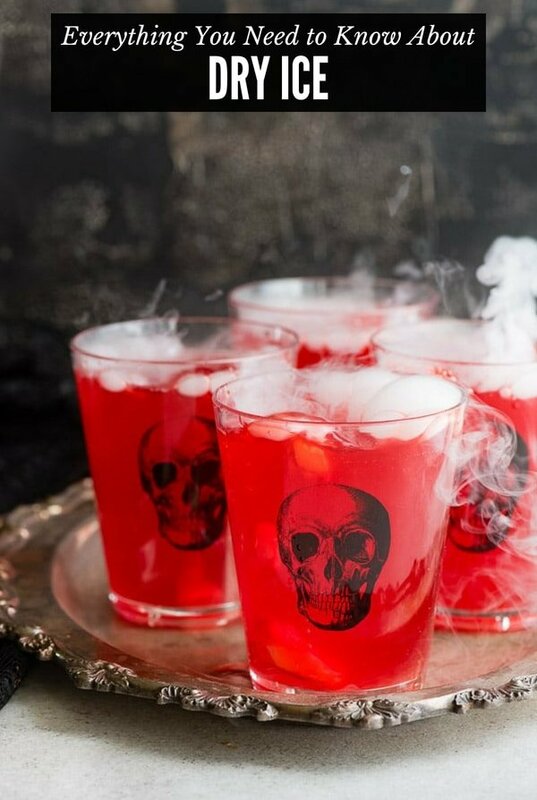 I think I may try making some spooky punch with it this year. You have some super helpful handling tips listed here, I’ll be sure to follow. This is SO necessary for me and my friends right now. 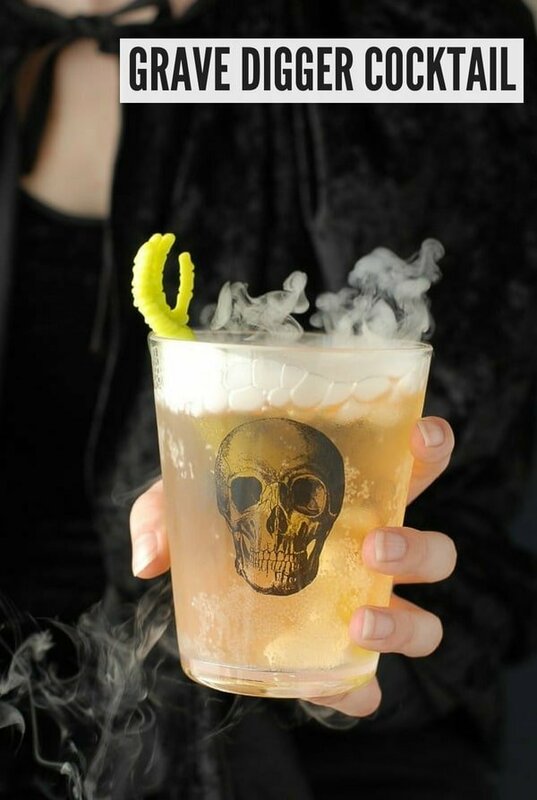 All the party drinks we want to serve for Halloween have dry ice in them!